The list of writers' galleries are sorted alphabetically by last name. 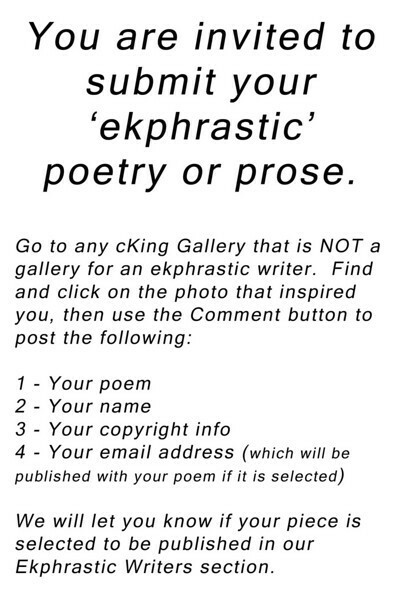 http://valerie6.myweb.uga.edu/ekphrasticpoetry.html: Ekphrasis: writing that comments upon another art form, for instance a poem about a photograph or a novel about a film. Keats' "Ode on a Grecian Urn" is a prime example of this type of writing, since the entire poem concerns the appearance and meaning of an ancient piece of pottery. Definition contributed by Keith Pruitt: TMI: "Ekphrasis" is about the relationship between a visual/physical aesthetic object and words. "Ekphrastic" encompasses exegesis/ explanation/ commentary of any one medium of artistic expression by any other medium in a way that captures the "essence" of the former work of art in a way that mirrors visual-linguistic ekphrasis; singing about architecture, for example.